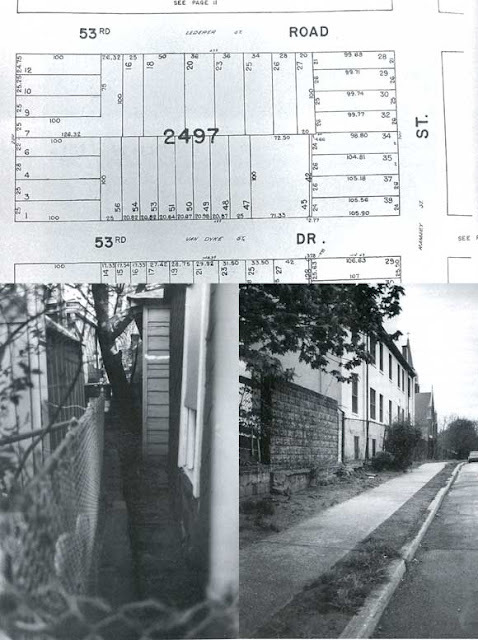 Uranculturalstudies’ recent post, “Deconstructing Reality: Gordon Matta-Clark” highlighting Matta-Clark’s well known body of work ‘building cuts’ (architectural interventions consisting of the strategic removal of building parts) got me thinking about Matta-Clark’s Fake Estates. 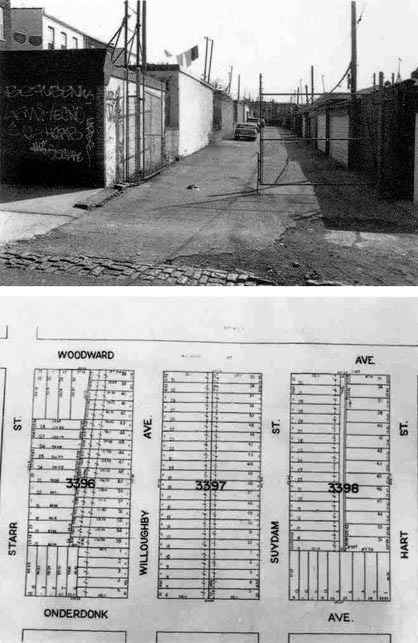 In 1973 and 1974, Gordon Matta-Clark purchased, at New York City auctions, fifteen “gutterspace” properties – unusually small slivers of land from the city through anomalies in surveying, zoning and public works expansion. The fifteen properties were scattered throughout Queens with one located on Staten Island. The properties are fragments of the city grid, patchy pieces of land that remained after the city was mapped out and land use designated. The left over spaces were along curbs, between houses, even inside a building. They were available to Matta-Clark because their location or size made them virtually unusable for any form of commercial real estate development – nothing could be built on them. Matta-Clark amassed an archive of deeds, maps, photographs of every inch of his lands, tax receipts, videotapes and other documents. He envisioned that the project would consist of the documentation of these urban voids – maps, photographs, surveying data and an inventory of botany found there – and the deed for the property itself, which the purchaser of the art work would then own. Unfortunately, Matta-Clark died before he could fully realise his plans. Following this idea a little further, I have always been interested in other artists who have created ‘fake’ enterprises. Janice Kerbel’s The Bird Island Project is a good place to start. Kerbel created a fake island in a very specific location – 24.36°N 76.40°W – in the Caribbean. 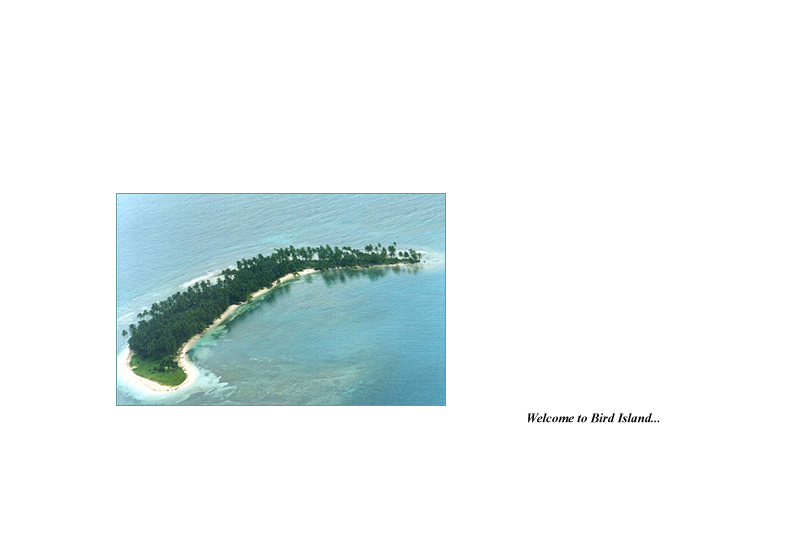 The project is composed of a website that introduces Bird Island to the public and markets timeshared villas. Of course, as attractive as Bird Island is, it can only ever be visited in the imagination. Another artist project is the Museum of Jurassic Technology conceived by David Wilson and Diana Wilson. The Museum of Jurassic Technology is located in Culver City and mimics the artifice of museum display to engage viewers in unusual histories and narratives. While researching my MFA thesis I stumbled on an article about these bats that could fly through walls. I couldn’t believe that this was true and had to find out more. It was a wonderful experience trying to decipher if what I was reading was real or fake. Here are a couple more projects.